Benjamin Franklin once said, “Time is money” and that got us thinking…how much do you actually get paid per hour? Does that sync up to how time you spend on projects? How do you invoice for your time? Time Tracker to the rescue! 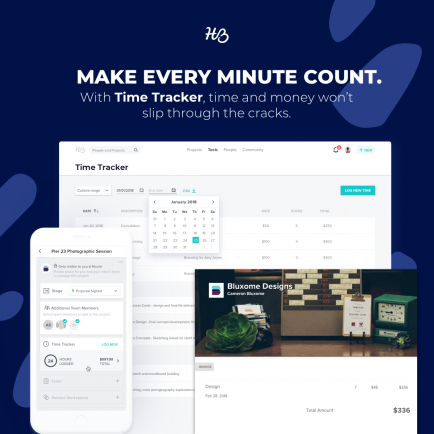 Our newest feature lets you keep track of the exact amount of time you’re spending on each project. Not a second gets unaccounted for—we’re talking phone calls, travel and design time, and everything in between. Here’s where the magic goes down: the time you track automatically fills out an invoice, and you never miss a hot billable second. Even if you don’t bill by the hour knowing how much time you’re actually spending on projects allows you to make sure you’re planning accordingly and charging your worth. Estimations are great, but actuals are better. Ditch the spreadsheets and sticky notes that you’ve been using to track time. Now you can quickly pop in new time entries for your projects and never miss a minute. Let’s make sure that you’re getting paid for your time. You can easily create invoices from all billable hours and send them off with a couple of clicks, turning your time into more cha-ching notifications. More than a CRM, HoneyBook is a proactive platform for creative small businesses to create, review, and manage—all in one place. From first reply to final payment, HoneyBook makes it easy for solopreneurs to book their ideal client faster, more frequently, and with less legwork.